Eating at Max Brenner, NY, with my hubby made all of his chocolate fantasies come true (let’s hope!). 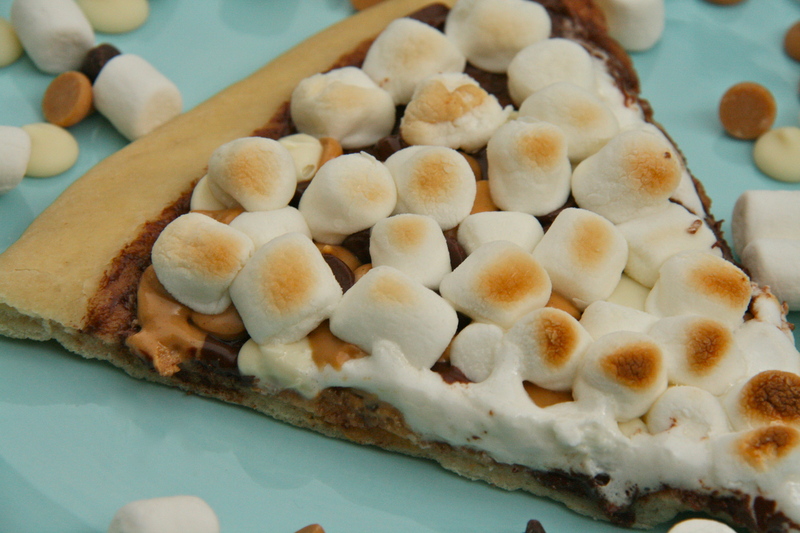 Chocolate, marshmallows and pizza, an unlikely combo, all oozing and melting as it makes its way into your mouth was his idea of Nirvana. Don’t get me wrong, I enjoyed it as well. I am the true chocoholic of our family, but for me decadence is the deepest, darkest chocolate only to be outdone by a scoop of crunchy nuts (preferably almonds or hazelnuts)… and maybe a hint of cointreau. He even photographed the pizza and texted it to numerous friends bragging about his bounty. A few weeks go by, and me, I’ve forgotten all about the “pie from heaven”, and Mother’s Day rolls around…and low and behold the cookbook from Max Brenner…Chocolate A Love Story (gotta love that title) ended up in my cache of gifts. Hmmm….I was starting to get suspicious. You see where this is headed don’t you? 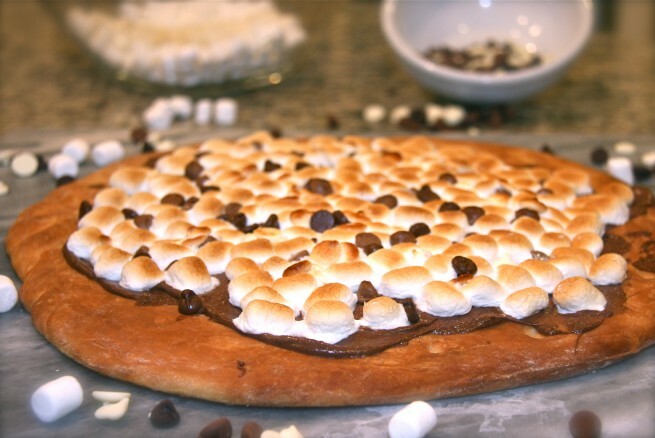 Wouldn’t you know it but Father’s Day was right around the corner and yep, you got it, he requested the Bad Boy Chocolate Pizza for dessert. I have tweaked it slightly from the original recipe in the book to include a crust with just a hint of sweetness. I know you are looking ahead to scan the list of ingredients and you see “HOMEMADE PIZZA DOUGH” jumping off the screen and making you run for the roll-it-out of the package kind, but DON’T DO IT, it just wouldn’t be right! The beautiful, tender crust that is just oh-so-slightly sweet and barely crispy helps guide those trifecta of chocolate chips all the way to your mouth for the perfect crunch and ooze factor (can you tell I have officially converted to the I LOVE chocolate pizza camp?). Store bought just won’t work. Some of you are thinking “Piece of Cake… I make my own crust all the time,” while others of you are still stunned. If you are in the stunned category, please stick with me through the crust walk through. There are only six ingredients, a bit of kneading if you don’t have a stand mixer, 1 hour of rising and roll it out. That’s it. No rocket science needed, not even a culinary arts degree. It’s simple, really and there is a HUGE bonus, you learn how to make badass pizza crust for the most delicious DIY savory pizza that you can make with mozzarella and tomato sauce another night. We make homemade pizza at least once a week at our house to feed any number of motley kids and teens that seem to meander around my kitchen. Saves about $20 from the order-in, cardboard style pizza. 1. Position the oven rack on the bottom of the oven and preheat to 450° F. Spray a large baking sheet with cooking spray. 2. Roll the dough onto a floured pastry board into a 9-inch round. Transfer to the prepared baking sheet (I usually wrap my pizza dough around the rolling pin and then gently unwrap it on the baking sheet). 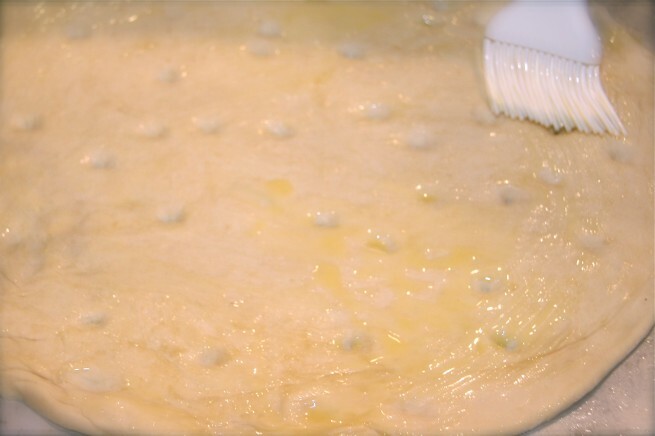 Using your fingers, make indentations all over the dough. Brush with the melted butter. Bake until the crust is slightly crisp and pale golden brown, about 20 minutes (mine took only 15). 3. 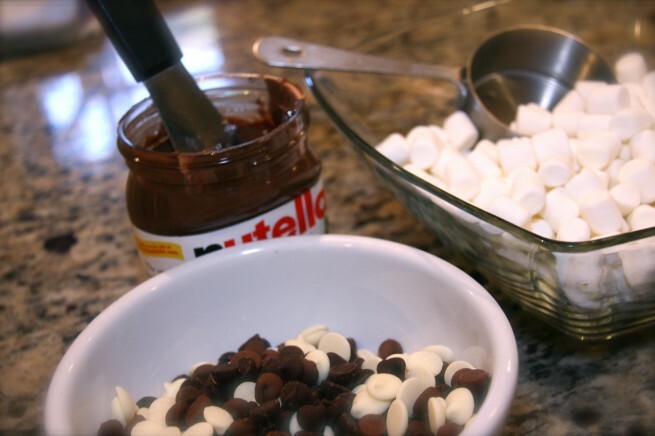 Immediately spread the Nutella over the pizza, then sprinkle with the chocolate chips and marshmallows. Bake until the chocolate just begins to melt, about 2 minutes. Broil for 30 seconds to one minute until marshmallows toast. ABSOLUTELY DO NOT LEAVE THE OVEN UNATTENDED for even 2 seconds at this point because it can turn from beautifully toasted marshmallows to charred chalk outline of once delicious looking chocolate pizza. My oven cooks unevenly so I acutally spin the cookie sheet 180° half way through the broiling process. Equally important…keep the pizza on one of the lower racks in your oven during the broiling time…otherwise…again black and crispy pizza. 4. Cut the pizza into wedges. Use luke warm tap water or heat up bottled water in the microwave for 30 seconds or so. Mix the water and yeast in your mixing bowl and let stand for a few minutes until the yeast dissolves. Mix it gently with a rubber spatula if it doesn’t fully dissolve. Add the flour, salt, and sugar into the bowl. Then add the melted butter. 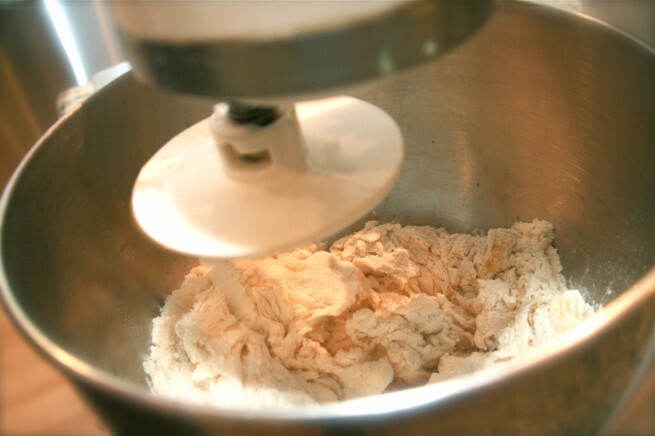 If you have a stand mixer, use your dough hook to combine the ingredients on the lowest setting. You can turn it to medium once the ingredients are semi-combined. If you just have hands, then combine ingredients with your spatula. With the stand mixer, you will need to turn it off every few seconds to scrape down the bowl. Make sure to incorporate any loose flour hanging out in the bottom and sides of the bowl. Your dough will take a few minutes to come together. If it’s just too dry to come together, add 1 extra teaspoon of water (up to 3 extra teaspoons, one at a time while it mixes). I usually just make sure to scrape out the last bits of butter and drizzle a few extra drops of water into the bowl. You don’t want it sticky or wet, but you do need it to form a ball. Once it’s in the ball form, knead it for one minute on a floured pastry board. Don’t clean the board yet, you will use it again in an hour. 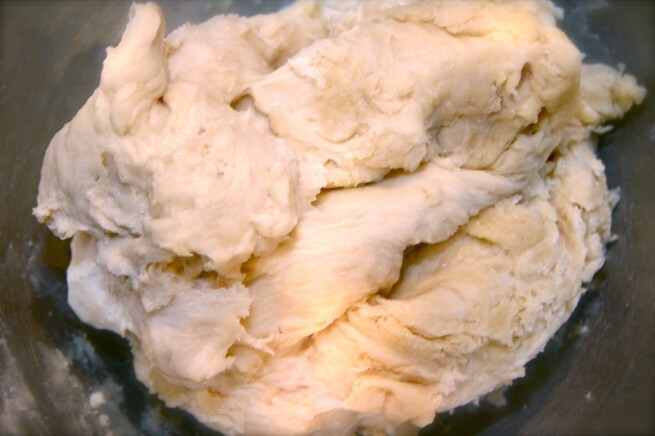 Place the dough into a butter greased bowl, big enough for the dough to double in size. Cover loosely with a clean kitchen towel, and let the dough rise in a warm spot in your kitchen. It should almost double. Now follow step one above and you are set. Categories: Chocolate, Other Desserts | Tags: bad boy chocolate pizza, dessert pizza, Max Brenner Chocolate Pizza | Permalink. a re post already? But I still love this recipie! is it a good recipe? i wanna try! i wanna try! It’s a great recipe and is very yummy. My whole family loves it when I make it. It’s only been 4 months? I already feel like I’ve known you forever! I made this a few days ago…yuuuummy! Just checked out your post. Thank you for the shout out! This pizza will disappear in seconds if it made it to my home! I love Nutella alot! Nice touch with that. Yes, it disappears in one sitting with my family as well. It’s worth it though! This is way awesome, I know someones birthday that is coming up and this will be a great treat . Your recipes are great!